It’s almost a week after shopping for lots of organic micro-greens, berries and other items from the ‘dirty dozen’ list. I must say, I feel better somehow; perhaps more awake and a little more energetic. The fruit and vegetables definitely have more flavour and in some cases more colour. Last night I had a dinner which is enjoyed by the whole family and always makes me feel good. I am going to share the recipe with you as it’s an easy, quick, mid-week favourite. The main ingredient is salmon and fortunately for me, abundant in both Canada and Australia. I used the sockeye salmon which is the beautiful red salmon. 1. Rinse salmon fillets and place into a large glass bowl. Add the teriyaki sauce to the salmon, be generous and add more if you like ensuring the fillets have been splashed and covered with the sauce. Cover with cling wrap and place in the fridge. 2. Rinse brown rice through and place into a medium-large saucepan. Add water and oil. Turn heat to high, and when it is boiling turn down to a simmer and place lid on top. Leave for approximately 15-20 minutes. 3. Wash greens; broccoli, celery and micro-green leafs. Chop celery finely and set aside. Chop broccoli into medium size florets (a few smaller for kids), and inside of stalk too removing the outside part. 4. Bring a small-medium saucepan of water to the boil ready for the broccoli to go in. Alternatively you can microwave for a few minutes with a small amount of water in dish. 5. Meanwhile, place teriyaki fillets and sauce into a non-stick frying pan on their skin side down. Turn heat to medium-high until you see the colour of the salmon changing and the sauce bubbling. Add the finely chopped celery half way through so they soften a little. You can use a lid for the pan to prevent splashing and poach salmon. If you see the sauce start evaporating, you can top up pan with some water from the broccoli. 6. Remove broccoli while firm (just soft enough to hold it’s shape) and drain. 7. Check rice and give it one stir only. When cooking rice using the absorption method you need to check that it is not sitting in any water (while simmering away) and that it cooks through without sticking to base of pot. Taste to get a feel and remove and fluff with fork after five minutes. 8. 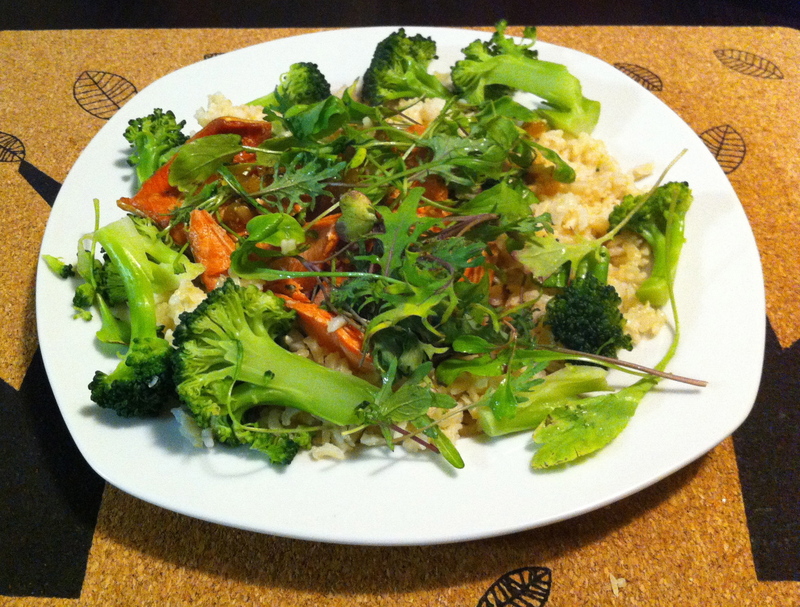 Remove salmon and celery (and any remaining sauce if you prefer) once just cooked through and place on a bed of brown rice with broccoli florets, and garnish with micro-greens. Please note: For kid’s flaking the salmon through the brown rice, soft celery and smaller broccoli florets is more palatable. Complement with an organic wine if you like and enjoy!